Pearl Harbor is an all-day tour. 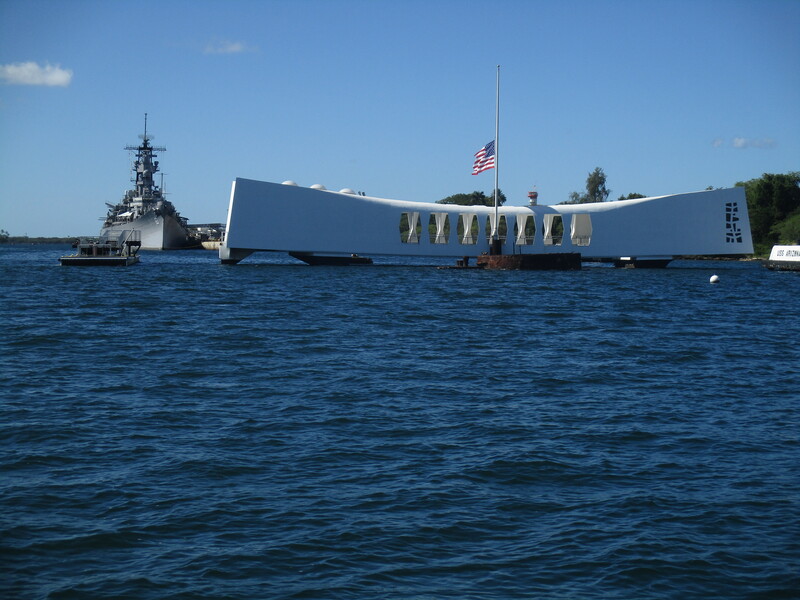 The greatest tragedy in American naval history, Pearl Harbor exhibits commemorate the soldiers that fell during the Japanese sneak attack on docked battleships. Starting with the Arizona Memorial, the film before you go out on the boat shows what led to the Japanese attack and why it was so successful. The Arizona Memorial dock is currently under repair, so visitors get a tour by the memorial with a guide who explains the story and answers questions. Get your tickets online, or you may not be able to go aboard the boat for this FREE tour. The Bowfin Submarine and its museum are included on the Go Oahu Card as are the below mentioned attractions. The audio guide explains the life of a submariner. I listened to the family version of the guide and found it much more entertaining than the adult version, but you can choose just by punching in the right number. A shuttle takes guests from the arrival center over a bridge to Ford Island. There, you’ll get to stand on the decks of the Missouri that stands watch over the Arizona. The Mighty Mo was where the Japanese formally surrendered to the Allied Forces. It also saw service during the Korean War and Desert Storm. If you love planes, the Pacific Aviation Museum is for you! A lot of restored aircraft occupy the two hangars. For me, the most interesting was a B-17 Bomber found in the swamps of New Guinea. Dubbed the “Swamp Ghost,” its insignia was drawn by Disney artists and features Donald Duck in the role of the Swamp Ghost. If you get hungry while at Pearl Harbor, your best choices for food are at Ford Island. In the shadow of the Mighty Mo is a food truck,and the Pacific Aviation Museum features a counter service restaurant. Both offer better food to eat than the $7 hot dog and the snack shop at the visitors’center. Next post: Is the 3-Day Go Oahu Card Worth It?